European legislation defines the minimum safety standards that cars must meet before they can be offered for sale in the EU. Euro NCAP's tests go above and beyond these minimum safety standards and are designed to deliver improved road safety by encouraging vehicle manufacturers to exceed minimum requirements. 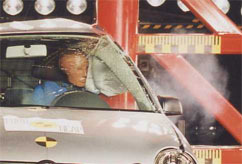 Some of Euro NCAP's tests, such as the frontal and side impact tests, are similar to the legislative tests in terms of configuration but apply more severe test conditions or performance criteria while others like the pole test and whiplash test don't currently feature in legislation at all. The test is an offset (40% overlap) impact into a deformable barrier with the car impacting the barrier at 40mph (64kph) - 8kph faster than in the corresponding legislative test. Representing the most common type of crash that causes serious or fatal injuries, this is a severe test of the integrity and stability of the passenger compartment and the performance of the restraint system - belts and airbags. Contact between dummies (adult driver and front-seat passenger) and intruding parts of the passenger compartment is taken into account as is knee contact with stiff structures in the lower part of the dashboard, footwell intrusion and pedal movement. The assessment is based on a combination of video and dummy data recorded during the test and a detailed inspection of the car following the test. Possible outcomes for larger or smaller occupants, occupants in different seating positions or crashes of slightly different severity are also taken into account. From January 2015 Euro NCAP has added a rigid barrier test with full overlap at a test speed of 50km/h. there is a small female frontal impact dummy seated in the front driver’s seat and also in the rear passenger side seat. This test is designed to test the ability of the car's restraint systems to cope with the higher rates of deceleration brought about by a general increase in car body stiffness. Smaller or elderly occupants are more vulnerable to injury. This complements euro NCAP's standard offset deformable test as a balance must be found between a restraint system 'stiff' enough to restrain a male dummy in the 64km/h test and one that is compliant enough to limit deceleration forces on a small female. A stationary car is struck in the drivers door at 30mph (50kph) by a deformable barrier mounted on a trolley. A single side impact test dummy sits in the driver's seat. This test represents the second most common crash configuration responsible for fatal and serious injuries, and the assessment takes account of the extent of side intrusion/deformation as well as the data from the crash test dummy. Side impact airbags have become common place as a result of this test. A quarter of all serious and fatal accidents result from side-on collisions where one car runs into another or a car runs into a tree or other stationary object like a lamp post, or bridge support. Euro NCAP first introduced the 'pole' test in 2000 to encourage installation of 'curtain' or head protection airbags and assess the protection they offer - an impact that would almost certainly be fatal without is made survivable by head protecting airbags. The car is propelled sideways at 18mph (29kph) into a rigid pole. The pole is relatively narrow, and usually penetrates deep into the side of the car. Initially optional, the pole test has been a standard part of Euro NCAP's model rating since 2009 with the assessment taking account of head, chest and abdominable injury as recorded by a single side impact dummy. Whiplash is the most common injury in vehicle crashes and can lead to long painful and debilitating symptoms for many years, with symptoms varying from mild stiffness, headaches and occasional dizziness to more serious and permanent impairment. Whiplash injury claims cost insurers over £2 billion in 2011 according to the ABI, adding around £90 to the cost of a typical car insurance policy. Whiplash can occur in front and side impact crashes but is most common in rear impact. Euro NCAP introduced a rear impact test from 2009 to assess protection against whiplash. Euro NCAP's tests encourage good seat design including head restraint geometry and ease of use. Ratings are based both on a geometric assessment of the seat and on a dynamic test - low, moderate and high severity rear impact tests using a seat mounted on a test sled. Scores contribute towards the adult protection score. From the outset Euro NCAP has included two child dummies in child restraints in the rear seat of the car for the frontal impact test and based it's child protection score on dummy data - head movement, neck loads and chest accelerations. The dummies represent children aged 11/2 and 3 years but the child seats used were those recommended by the vehicle manufacturer. As most child seats in use are 'universal', bought from specialist retailers, and transferred from car to car the results of tests using seats from the car manufacturer are of limited relevance. From 2012, Euro NCAP carries out a child seat installation check using a range of popular child restraints across all age groups. The assessment considers things like seat belt length, belt buckle location, accessibility of ISOFIX anchorages and the stability of the child restraints as well as the quality of information in the vehicle handbook. Additional points are available for features such as multiple ISOFIX positions, passenger airbag de-activation switches and integrated child seats. Euro NCAP's pedestrian tests assess the areas of the bumper, bonnet leading edge and bonnet that are most hazardous to both child and adult pedestrians. It is not practicable to use a full dummy for these tests because of the difficulty in controlling how the head of a standing dummy, struck in the legs by the bumper, will strike the bonnet top. The tests involve firing dummy body parts at the car simulating accidents at 40kph (25mph) - a simulated leg is impacted against the bumper, an upper leg against the front edge of the bonnet, and dummy heads, both child and adult-sized, at points on the bonnet. Euro NCAP changed the limit values, the way points are awarded and the way impact sites are selected from 2002. As a result pedestrian ratings from before June 2002 cannot be compared directly with those after June 2002. To provide effective head protection the bonnet must be able to deflect and this is only possible of there is sufficient clearance above the stiff engine structures below. Some car manufacturers are now fitting pop-up bonnets triggered by contact sensors in the bumper. Euro NCAP tests these in the raised condition. Cars equipped with ESC are less likely to be involved in accidents and all new car models introduced since 2012 have been required to be fitted with ESC as standard. From 2014 all new cars sold will have to be fitted with ESC. From 2009, Euro NCAP set out to encourage more rapid adoption of ESC by awarding three 'safety assist' points where ESC is fitted as standard across an entire model range or where it is optional across the range but more than 95% of cars sold are expected to have it fitted. By 2012 the points are only awarded where ESC is fitted as standard across an entire model range. Since 2011 Euro NCAP has supplemented the fitment requirement with a dynamic double lane change test at 80 kph (50mph) known as 'sine with dwell' - essentially the car, driven by a robotic driver system, is made to swerve suddenly into an adjacent lane as if passing an obstruction and then swerve back into the original lane. the car must remain stable, complete the lane change and follow a straight path after the manoeuvre. Seatbelts are the most effective and important safety system and belt wearing rates in the UK are very high but those not wearing belts are overrepresented in crashes - more than a third of car occupants killed in collisions are not wearing seatbelts according to the AA Seat belt report. Occupants are much more likely to wear their belts in cars equipped with a seatbelt reminder (SBR) so Euro NCAP encourages and rewards the fitment of effective SBR systems. The loudness and duration of audible warnings is tested in a variety of scenarios together with the position and clarity of any visual warning. Points are awarded for driver, passenger and rear seat reminder systems. Euro NCAP is encouraging the fitment of voluntary-set speed assistance systems that help drivers to control their speed and comply with local speed limits. EuroNCAP has always tried to encourage more widespread fitment of effective safety technologies by including them in its ratings at a relatively early stage compared to the possibility of regulation. From January 2014, crash avoidance systems have been included in EuroNCAP's ratings. Two types of AEB are tested, AEB City and AEB Interurban. AEB City tests the car's ability to avoid low speed rear-end collisions - a common cause of whiplash injury. A high score is awarded to systems that avoid a collision in all test conditions, or significantly reduce the severity of the crash. Lane Keeping Assist/Lane Departure Warning systems are also tested/rewarded.